You guys, I have banh mi on my mind, and my mind on banh mi. I was giving a work presentation a few months ago (yes, it has been months), and I gave the example of a local search query [banh mi in Milpitas]. It’s been problematic since then. I have a lust for this delicious byproduct of French colonialism in Asia that cannot be satiated. Also, side note, there are some seriously good sandwiches in Milpitas, so, go forth and explore if you are so located and inclined. Or stay in your pajamas and eat quick-pickled veg on toast, I don’t judge. 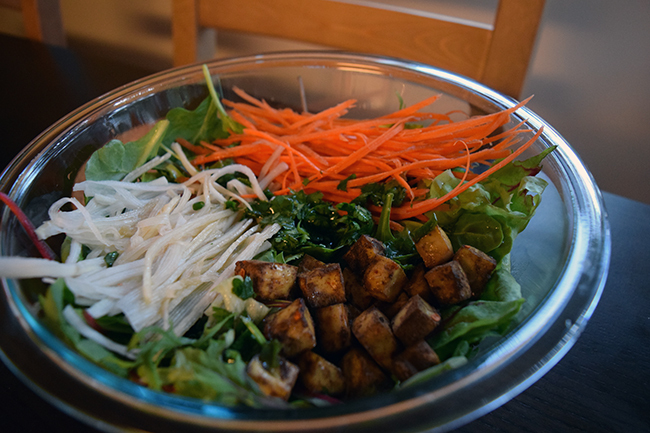 While I would probably enjoy eating sandwiches all day long, in my usual spirit of salad-ing all the things, I’ve taken some highlights from banh mi and piled them atop greens. My new crowd-pleasing dish is, bafflingly, this five-spice tofu! It’s really stupidly simple to make, astonishingly virtuous, and it gives tofu a little toothsome bite and extra flavor without obliterating it. It’s the (vegetarian-ish hostess) dream, really. Combined with my other favorite trick of quick-pickling some veg that I’ve hacked at with a julienne peeler, this is a showy salad that’s pretty tasty. I won’t lie to you, it’s no replacement for a sandwich on perfectly crisp-chewy bread, but it’s a nice meal that’s both fresh and satisfying. Plus, you can probably fit in halo halo for dessert if you have a salad as your meal, right? And more coconut cream is always a win for me. Optional but definitely recommended — press the tofu to release some moisture. This seems like a pain but greatly decreases the bake time later. Just slice it into 4 or 6 even slices and place on a cutting board. Cover the slices with a couple pieces of paper towel and lay something heavy that won’t mind getting damp on top. I use a cast iron pan. Let it sit for at least 20 minutes. It will slowly press out liquid, leaving the tofu more able to pick up other flavors and also bake faster. Preheat the oven to 350˚F. If you need the oven at a different temperature for something else, it’s fine. I’ve gone as high as 400˚F without noticing any huge differences in the finished tofu, so don’t worry too much about the exact temperature. 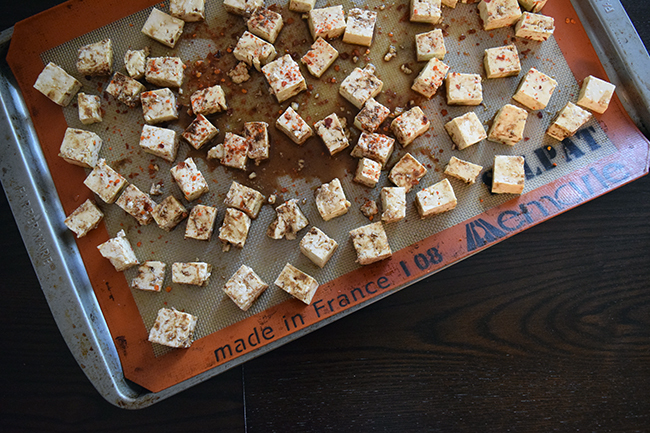 Cut the pressed tofu into small cubes. The cubes will shrink up when baked, so keep that in mind if you have a specific size you want to end up with. Toss the tofu with the soy sauce, Chinese five spice, and crushed red pepper, if using. Lay the tofu on a Silpat or parchment lined baking sheet, arranging such that none of the pieces are touching. Bake until the tofu puffs up (they will deflate when cooled), at least 30 minutes for me and my oven, though time will vary based on the size of the cubes. This recipe makes quite a lot — enough for several salads, but I find that it makes a good snack, too, so it never seems to stick around long enough for another salad! Slice carrot and daikon into strips. A julienne peeler, mandoline, or spiralizer makes quicker work out of this, but they are not necessary. Place in a bowl and drizzle with the rice vinegar. Let them sit and “pickle” slightly while you prepare the other ingredients. Prepare the cilantro and ginger for the dressing by chopping both finely. Or, I prefer to keep my ginger in the freezer and then grate/microplane it — negates the need for peeling, which I like. Combine with sesame oil, soy sauce, and lemon juice. Sorry about the vague amounts! Sometimes I want a lemony dressing, and sometimes I don’t! I’ll sweeten with honey or agave occasionally, too. 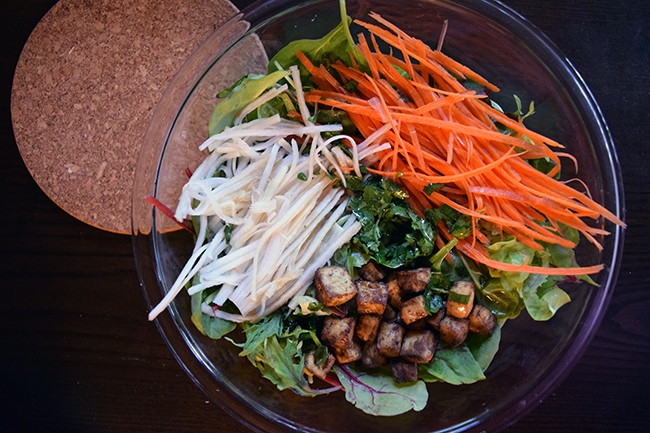 Arrange the carrots, daikon, and tofu on top of washed and spun salad greens. Drizzle the dressing on top immediately before serving.